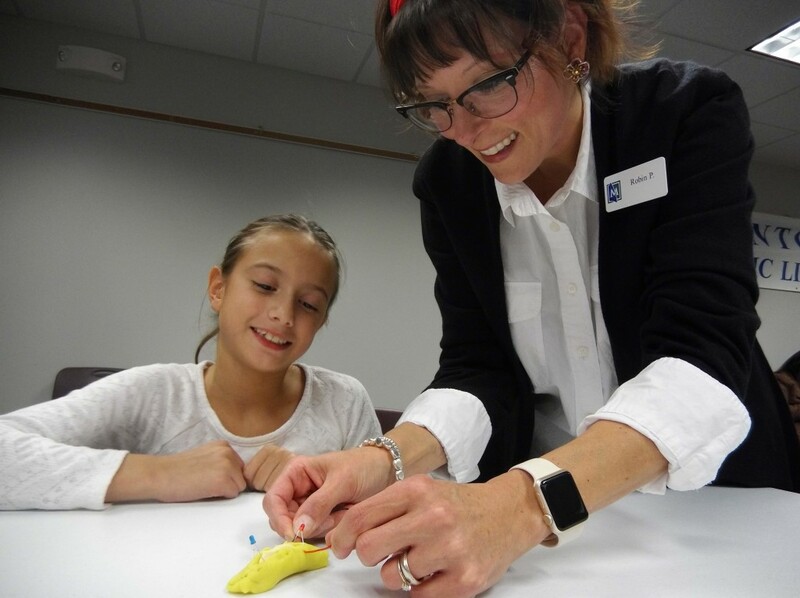 Ms. Robin helps Sarah make a circuit with play-dough, clay and two light-emitting diodes. The kids made circuits out of play-dough, clay and LEDs, which stands for light-emitting diodes. While we usually use metals to conduct electricity, other household items like play-dough or a potato can also carry enough charge to light a bulb. For those who aren’t familiar with the acronym, STEAM stands for Science Technology Engineering Art and Math. And here are five resources we have for any family that want to learn more about these topics. Our Picking Up STEAM Club meets each month at our Lake Branch to explore the weird and wonderful world of science and math. The next meeting is 2 p.m. on Saturday, Nov. 10. We’re using LEGO blocks to learn about engineering. Our Lake Branch also has a STEAM station where fledgling scientists as young as two can learn about science, tech and more by playing with our educational toys. Additionally, kids can check out the STEAM kits at our Main Branch. Experiment with magnetism, electricity and the water cycle with our physics kit. Design a race car or an amusement park ride. Learn the basics of coding with an Ozobot. Kids can use any of our kits in the library. (Sorry, they’re not available for lending.) Peruse your options at our Children’s Desk. Our Main Branch is hosting another STEAM program at 4 p.m. on Tuesday, Nov. 27. This time we’re focusing on engineering. We have a brand new coding club at our newest location — The HUB (which is inside Mentor High School.) Join us at 3:30 p.m. on the first Tuesday of each month. In this self-paced club, kids (fourth grade and higher) can earn badges as they reach certain milestones. Earn all the badges to become a Programming Wizard! Our next meeting is Nov. 6. Finally, don’t forget about the thousands of books and videos we have to offer. Whatever niche of science, technology or art your child cares about, we can help them learn more about it. This entry was posted in Uncategorized and tagged Lake Branch, Mentor Public Library, Mentor-on-the-Lake Branch, STEAM, STEM, tech, technology, The HUB. Bookmark the permalink.